Celebrate one of the happiest annual occasions by sending this stunning birthday flower combo gift to that special someone! Large 18 inch Helium Balloon included. The hand tied bouquet of peach avalanche roses, germinis, stallion chrysanthemums and bouvardia is held together with raffia for that final touch. 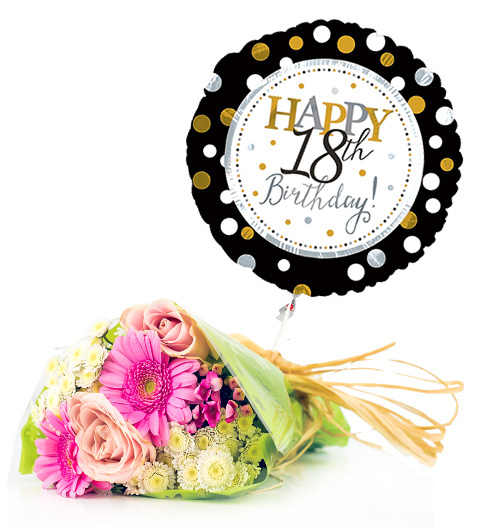 We have also included a beautiful Happy Birthday helium balloon with your choice of 18,21,30,40,50,60, or 70 printed on it! These are great for celebrating those wonderful milestone birthdays and, best of all, this gift is available for UK next day delivery!